Contest winner recalls the indelible imprint her father has made on her life. Tori Streitmatter, the 2017 #RootedinAg winner, and Dave Streitmatter, her dad. Tori Streitmatter vividly remembers racing her brother and sister home from school during calving season. If she found a calf in the barn, she not only earned a dollar, but was also given the opportunity to write the number on the animal’s ear tag. Moments like that from Streitmatter’s childhood flood her memory when someone asks about her father or her upbringing in the small town of Sparland, Illinois. “Looking back, it’s hilarious, but those are the little perks that we looked forward to,” she says. Streitmatter recently won Thrive’s 2017 #RootedinAg contest, which asked growers and other ag industry professionals across the country to describe the person who most nourished their agricultural roots. She won the contest, based on the number of online votes she received and the quality of her essay, as determined by a panel of judges. Streitmatter, who currently works in human resources and recruiting for agricultural supply cooperative GROWMARK, Inc., chose to write about her father, Dave, whom she calls the “architect behind her work ethic.” Today, he primarily grows corn and soybeans on the family’s sixth-generation farm. Tori Streitmatter 2017 #RootedinAg Winner: Tori Streitmatter (left), the 2017 #RootedinAg contest winner, credits her dad Dave (right) with helping to firmly establish her agricultural roots. They pose for a photo on their farm in Sparland, Illinois, with Clutch the dog. 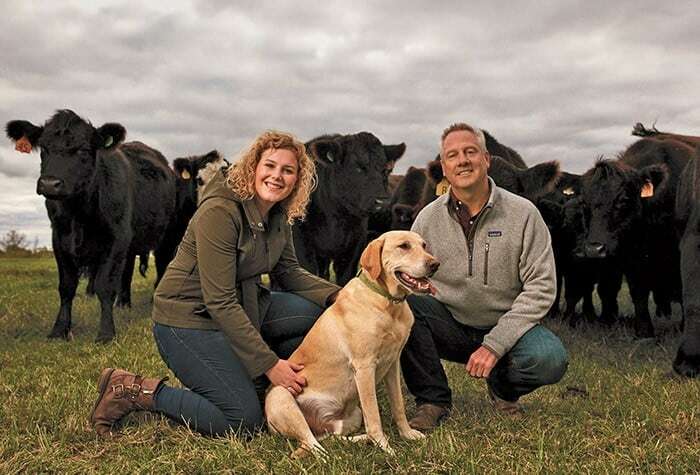 Tori Streitmatter 2017 #RootedinAg Winner: In addition to corn and soybeans, the sixth-generation Streitmatter farm also produces beef cattle. Tori Streitmatter 2017 #RootedinAg Winner: Since she was a child, Tori (left) has spent special time on her family’s farm with her dad Dave (right) and twin sister Taylor (center). Tori Streitmatter 2017 #RootedinAg Winner: Today, Tori (center) still spends special time with her dad Dave (right) and her sister Taylor (left) on the Streitmatter farm. Tori Streitmatter 2017 #RootedinAg Winner: Tori (right) and her twin sister Taylor (left) share a love of family and agriculture. Tori Streitmatter 2017 #RootedinAg Winner: Dave has instilled a deep appreciation of agriculture in all three of his children. 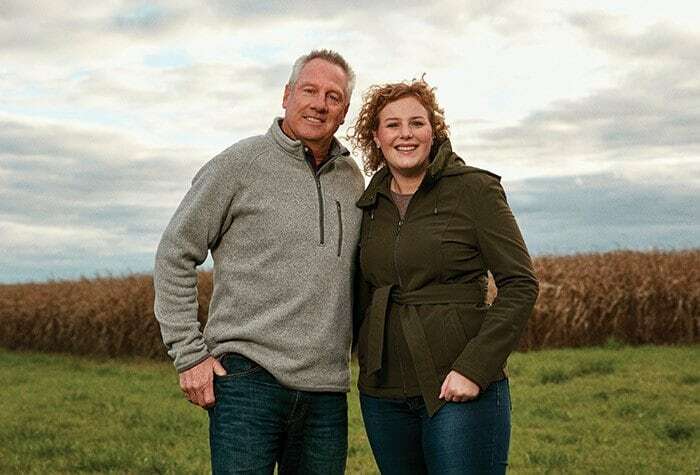 Tori Streitmatter 2017 #RootedinAg Winner: Tori, who works at GROWMARK, Inc., in human resources, carries on her father’s farming legacy by helping a new generation succeed in the ag industry. Her father also pushed involvement in the community and the agriculture industry. Streitmatter recalls no matter how many sports or extracurricular activities she and her siblings took part in, her father made sure they were always in 4-H and FFA. “Throughout all my schooling, I wanted to be like Dad, always networking, making friends and not knowing a stranger,” she says. That sense of community and networking, central to the agriculture industry, led Streitmatter to her current job in talent acquisition. She says the connectivity her father preached has come full circle as she helps bring new faces into the industry. #RootedinAgContest winner @torstreitmatter on the grower behind her work ethic. Her contest win will also help Streitmatter benefit others in agriculture. Syngenta has made a $1,000 donation in her name to the Midland FFA Alumni, to help students who are pursuing ag degrees in her local area attend regional and national conferences. She hopes to offer more students the opportunity to grow and connect through the organization as she did. 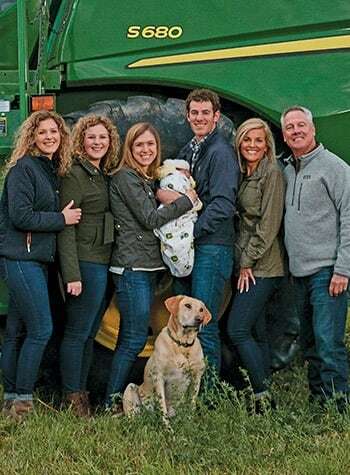 The Streitmatter family enjoys a day together on the farm; (left to right) Taylor, Tori, Kaitlyn, baby Reid, Jay, Ann, Dave and Clutch, the dog. The family farm is still a major part of her life. Streitmatter, her brother and her sister each live within an hour of the operation and often return on weekend trips. When she was growing up, Streitmatter’s grandparents, on both sides of the family, lived nearby and played active roles in developing her agricultural roots. Her father made sure she knew the history of their family. To prescribe the best crop solutions, Syngenta focuses on generating field force excellence and earning sustained partnerships.